A lovely, deep, dark nose of slightly herbal black/red cherry with a touch of balsamic, liquorice, cassis and wood smoke. Dry, soft acidity and tannins. 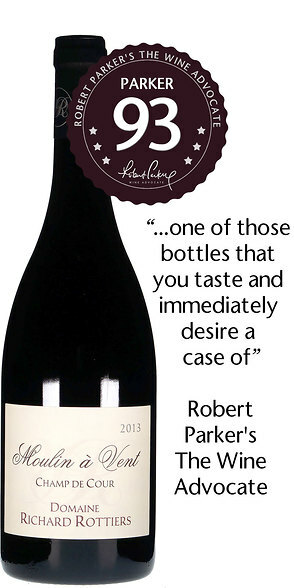 Silky, seamless and saturated with black/red cherry, liquorice, minerals and blackcurrant. Subtly herbal on the middle with a touch of strawberry and pepper. Superb length with a lovely, long, dark chocolate infused finish. The 2013 Moulin-a-Vent Champ de Cour comes from a parcel located on clay-rich soil next to the titular windmill and is occupied by 80 year old vines. It usually undergoes a long maceration - 30 days in 2013, and subsequently aged in barrel for one year. It has a precise maraschino cherry and cassis-scented bouquet that is seamlessly integrated with the oak. The palate is medium-bodied with fleshy, ripe tannin, very good acidity, and an energetic, precise sorbet orange and kirsch-tinged finish that will put a smile on your face. It's one of those bottles that you taste and immediately desire a case of. If you have not tasted Richard's wines before then do yourself a favor. He is one of the new breeds of grower that advocate traditional practices but with a forward-thinking attitude. There is a distinction here between the Beaujolais Villages and the bottlings of Moulin-a-Vent. Both the "Denier Souffle" and the "Champ de Cour", the latter from 80-year old vines, are exceptionally fine and with price tags that would shame much of the Cote d'Or. There is a natural approach to these wines, perhaps a sense of honesty that I picked up on when I tasted his wines last year. I have no experience of older vintages (perhaps next time) but I suspect that they repay cellaring as long as you can resist temptation!"